Website designing for your Business is the first and most important step in creating your business identity on the internet. Designing a website for your business helps users from around the world to easily contact you and know more about your services. Without a website you are no-where in the competitive market. Even if your business is running successfully in the past but with the emerging trend of smartphones, you are almost 50% of potential customers. Website is the face of your online business which is always focused towards bringing business and quality traffic, so it is beneficial to have a professional web design. There are infinite benefits of hiring a reputable and professional web design company to deliver the best website design for your business which will improve web traffic and brings quality business. 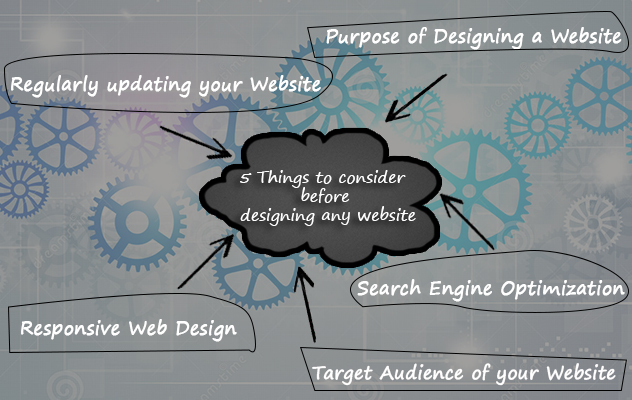 Let us discuss 5 most important things to consider while designing a website either for yourself or for your client. a) For increasing Brand awareness. b) To let your customers contact you online. c) For generating sales and leads. d) For sharing the service and other related information you offer with your customers. It is very important to know who the target audience of your website is and why they should visit your site. You have spent your precious time in designing a website not for you but for your audience, target customers and most importantly your clients. Once you find out who your audience is, you can start your website accordingly. Also it is necessary to keep in mind the age group of your audience. Like if you are designing an online store for kids garments they the layout, design and color of your website should be very kiddish keeping the mind the taste of kids. Similarly, on the other hand if you are showcasing your services to customers to bring business from them, your website should be clean and must have a professional look. So finding the right audience for your website is very important which will ultimately bring potential customers to your website, your services and will boost your sales. Gone are the days when the process of web designing is only limited to designing and developing 4-5 important static pages and then uploading it on server. That’s it!! Now you need to regularly update your website according to your web needs. You need a very simple and powerful Content Management System to manage the contents, services and other important information of your website by yourself and with ease. The website you are designing should be responsive which is visible properly on all kind of mobile devices regardless of its screen size. One of the emerging and growing web trend in IT industry is the Responsive web design that is continuously gaining serious attention with the skyrocketing popularity of smartphones and tablets among large number of users especially youngsters and business owners. Website you are designing should be responsive so that your customers can browse your services at any-time, anywhere using their handheld devices. Search Engine Optimization to let Google know and crawl your website fast. SEO helps you to attain good ranking in major search engines. Here are some tips to make your online store a big and successful business for you.